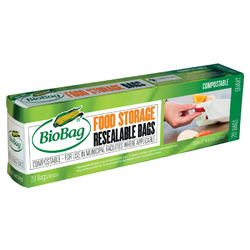 BioBag is excited to bring you their newest Compostable Product: Food Storage Resealable Bags! Widely use for the collection of food and yard waste for composting, BioBag is the world's largest selling brand of compostable bags and films made from the material, Mater-Bi. Live Cycle Analysis (LCA) shows that bags made of Mater-Bi have a better environmental impact than paper bags when the end of life is composting. BioBag products are made with annually renewable crops and contain no polyethylene. Bags are made for a breathable material which helps keep foods like veggies and fruits fresher, longer. However, may not be suitable for long-time storage of all foods.Made with GMO Free cropsBPA & Polyethylene FreeCertified by the Biodegradable Products InstituteApproved by the FDAGreat for On-The-Go Uses: Work, school lunches, travel, picnics or for storage at home.Not recommended for use in the microwave or storing liquids.